Note: Aleene's Big Book of Crafts was a subscription service for craft patterns from 1993 - 1995 or so. Patterns are for a variety of mixed, non-needlework crafts (many using recycled household materials), and are all punched for storage in a 3-ring binder. Please note that some of these refer to techniques in a previous card or tip sheet. I've tried to catch all of these, but may have missed a few. 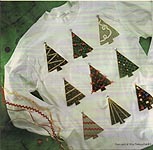 Aleene's Big Book of Crafts Christmas Fun Card 1: Festive Holiday Shirts, Oxmoor House/ Leisure Arts, 1993. Pattern sheet from subscription series; sweatshirt embellishments made with wearable foil, rubber stamped Shrink-It, and acrylic jewels. Excellent condition. May smell slightly of cigarette smoke. 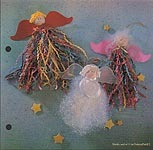 Aleene's Big Book of Crafts Christmas Fun Card 2: A Trio of Angels, Oxmoor House/ Leisure Arts, 1993. Pattern sheet from subscription series; Angels with wooden ball heads paper or foil lace doily dresses/ wings. Excellent condition. May smell slightly of cigarette smoke. 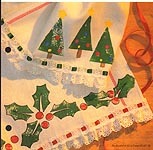 Aleene's Big Book of Crafts Christmas Fun Card 3: Paper Lace Angels, Oxmoor House/ Leisure Arts, 1993. 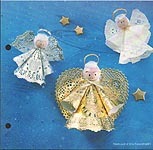 Pattern sheet from subscription series; Angels with wooden ball heads and craft strand or paper strips with Shrink- It wings. Excellent condition. May smell slightly of cigarette smoke. Aleene's Big Book of Crafts Christmas Fun Card 4: Nail- Punched Ornaments, Oxmoor House/ Leisure Arts, 1993. 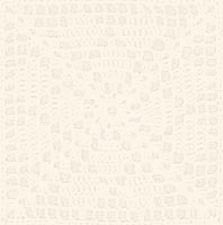 Pattern sheet from subscription series; Nail punch on heavy cardboard with design in acrylic paint. Excellent condition. May smell slightly of cigarette smoke. 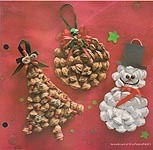 Aleene's Big Book of Crafts Christmas Fun Card 5: Pinecone Ornaments, Oxmoor House/ Leisure Arts, 1993. Pattern sheet from subscription series; Snip the scales from the pinecones, then glue to shaped cardboard to form Tree, Snowman, or Ball. Paint with acrylic paint and trim.. Excellent condition. May smell slightly of cigarette smoke. 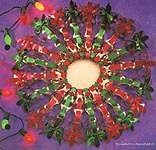 Aleene's Big Book of Crafts Christmas Fun Card 6: A Wreath of Paper Roses, Oxmoor House/ Leisure Arts, 1993. Tissue paper roses on a foam wreath form and highlighted with pearlescent paint. Excellent condition. May smell slightly of cigarette smoke. Aleene's Big Book of Crafts Christmas Fun Card 7: Shrink- It Gift Tags, Oxmoor House/ Leisure Arts, 1993. Pattern sheet from subscription series; Gift Box or Heart tinted with markers or colored pencils may also be used as ornaments. Excellent condition. May smell slightly of cigarette smoke. 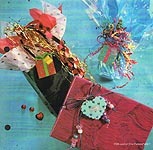 Aleene's Big Book of Crafts Christmas Fun Card 8: Paper Garlands, Oxmoor House/ Leisure Arts, 1993. 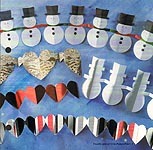 Pattern sheet from subscription series; Snowmen or Heart garlands cut from white or gift wrap paper and decorated with markers or colored pencils. Excellent condition. May smell slightly of cigarette smoke. Aleene's Big Book of Crafts Christmas Fun Card 9: Festival of Trees, Oxmoor House/ Leisure Arts, 1993. 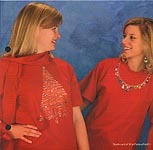 Pattern sheet from subscription series; decorate fabric Christmas trees with ribbons, jewels, and other trims. Excellent condition. May smell slightly of cigarette smoke. Aleene's Big Book of Crafts Christmas Fun Card 10: "Beary" Easy Tree Skirt and Card 11: "Beary" Easy Stocking, Oxmoor House/ Leisure Arts, 1993. 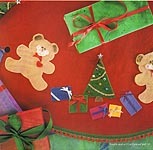 Pattern sheet from subscription series; glue felt bears, gifts, and trees to felt circle or new- sew felt stocking, then embellish. Excellent condition. May smell slightly of cigarette smoke. NOTE: I am grouping these two patterns together because the stocking pattern does NOT have the Bear and Tree applique patterns, requiring that you have the Tree Skirt card. 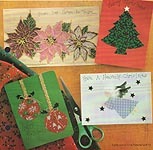 Aleene's Big Book of Crafts Christmas Fun Card 12: Holiday Cards, Oxmoor House/ Leisure Arts, 1994. Pattern sheet from subscription series; Fabric cutouts fused to paper for Ornament, Tree, and Angel. Excellent condition. May smell slightly of cigarette smoke. 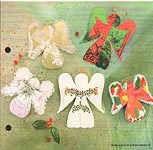 Aleene's Big Book of Crafts Christmas Fun Card 13: Christmas Card Angels, Oxmoor House/ Leisure Arts, 1994. 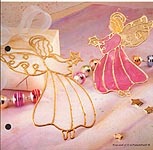 Pattern sheet from subscription series; 3- d angels from old Christmas cards. Excellent condition. May smell slightly of cigarette smoke. 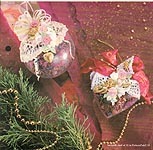 Aleene's Big Book of Crafts Christmas Fun Card 14: Victorian Ornaments with Potpourri, Oxmoor House/ Leisure Arts, 1994. 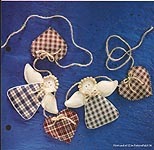 Pattern sheet from subscription series; Ball and Heart- shaped ornaments using clear plastic forms filled with potpourri (recipe included) and trimmed with lace and various other embellishments. NOTE; Recipe and instructions for Bread Dough Roses NOT included. Excellent condition. May smell slightly of cigarette smoke. Aleene's Big Book of Crafts Christmas Fun Card 15: Lacy Angel, Oxmoor House/ Leisure Arts, 1994. 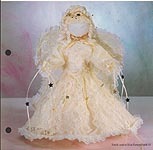 Pattern sheet from subscription series; Angel is dressed in eyelet and lace over a styrofoam ball head atop a glass bottle. Excellent condition. May smell slightly of cigarette smoke. 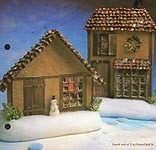 Aleene's Big Book of Crafts Christmas Fun Card 16: Gingerbread Ornaments, Oxmoor House/ Leisure Arts, 1994. 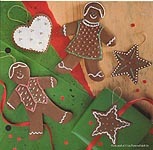 Pattern sheet from subscription series; brown grocery bag shapes (Gingerbread Boy, Girl, Heart, and Star) decorated with shiny dimensional paint. Excellent condition. May smell slightly of cigarette smoke. 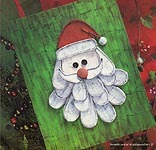 Aleene's Big Book of Crafts Christmas Fun Card 17: Ribbon Santa, Oxmoor House/ Leisure Arts, 1994. Pattern sheet from subscription series; extra- wide ribbon, pompoms, felt, and some batting. Excellent condition. May smell slightly of cigarette smoke. Aleene's Big Book of Crafts Christmas Fun Card 18: Glittery Snowflakes, Oxmoor House/ Leisure Arts, 1994. 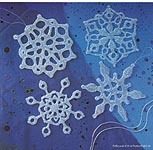 Pattern sheet from subscription series; sprinkle glitter on glue to create four different snowflakes. Excellent condition. May smell slightly of cigarette smoke. 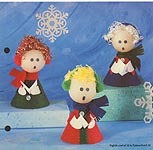 Aleene's Big Book of Crafts Christmas Fun Card 19: Cozy Carolers, Oxmoor House/ Leisure Arts, 1994. Pattern sheet from subscription series; Felt covered cardboard body, styrofoam ball head and curling ribbon hair! Excellent condition. May smell slightly of cigarette smoke. 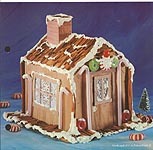 Aleene's Big Book of Crafts Christmas Fun Card 20: Cinnamon Stick House, Oxmoor House/ Leisure Arts, 1994. Pattern sheet from subscription series; Cinnamon sticks glued onto a cardboard/ brown grocery bag house and decorated with "snow texture medium," candy, and drinking straws. Excellent condition. May smell slightly of cigarette smoke. 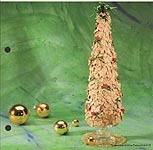 Aleene's Big Book of Crafts Christmas Fun Card 21: Golden Tabletop Tree, Oxmoor House/ Leisure Arts, 1994. Pattern sheet from subscription series; Rows of corn flakes glued to a styrofoam cone, then spray painted and embellished. Excellent condition. May smell slightly of cigarette smoke. 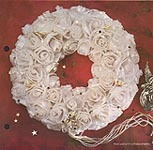 Aleene's Big Book of Crafts Christmas Fun Card 22: Ring a Wreath With Roses, Oxmoor House/ Leisure Arts, 1994. Pattern sheet from subscription series; plastic rings from 6- packs of canned drinks with a little spray paint and some ribbon make this unusual wreath. Excellent condition. May smell slightly of cigarette smoke. 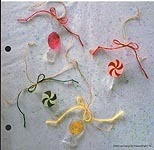 Aleene's Big Book of Crafts Christmas Fun Card 23: Merry Napkin Rings, Oxmoor House/ Leisure Arts, 1994. 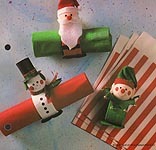 Pattern sheet from subscription series; toilet paper / paper towel tubes, wooden ball heads, and felt are the main ingredients for this cute Elf, Santa, and Snowman. Excellent condition. May smell slightly of cigarette smoke. Aleene's Big Book of Crafts Christmas Fun Card 24: Holiday Houses, Oxmoor House/ Leisure Arts, 1994. Pattern sheet from subscription series; 2 designs made with styrofoam covered with sandpaper; pinecone pieces make the roof. NOTE: Instructions for "wood grained brown bag" doors and window frames not included -- may be found in Card 20, Cinnamon Stick House. Excellent condition. May smell slightly of cigarette smoke. 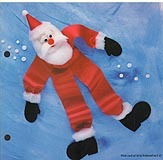 Aleene's Big Book of Crafts Christmas Fun Card 27: Paper- Mache Santa Picture, Oxmoor House/ Leisure Arts, 1995. Pattern sheet from subscription series. Excellent condition. May smell slightly of cigarette smoke. 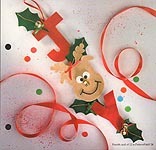 Aleene's Big Book of Crafts Christmas Fun Card 28: Jingle- Joy Banner, Oxmoor House/ Leisure Arts, 1995. Pattern sheet from subscription series; Felt, cardboard, and embellishments create this decoration. Excellent condition. May smell slightly of cigarette smoke. Aleene's Big Book of Crafts Christmas Fun Card 30: Faux Stained Glass Angels, Oxmoor House/ Leisure Arts, 1995. Pattern sheet from subscription series; Tissue paper, glue, and metalic dimensional paint are the main ingredients for these beautiful angels. Excellent condition. May smell slightly of cigarette smoke. 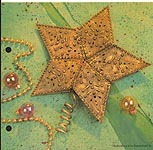 Aleene's Big Book of Crafts Christmas Fun Card 31: Star Tree Topper, Oxmoor House/ Leisure Arts, 1995. Pattern sheet from subscription series; cardboard pieces decorated with hole punches and an embossed glue design. Excellent condition. May smell slightly of cigarette smoke. Aleene's Big Book of Crafts Christmas Fun Card 32: Holiday Guest Towels, Oxmoor House/ Leisure Arts, 1995. Pattern sheet from subscription series; tree and holly sponge- painted designs. Excellent condition. May smell slightly of cigarette smoke. 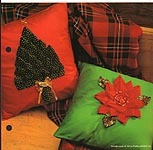 Aleene's Big Book of Crafts Christmas Fun Card 33: Festive Pillows, Oxmoor House/ Leisure Arts, 1995. Pattern sheet from subscription series; fabric pieces and fusable webbing create Tree and Poinsettia designs. Excellent condition. May smell slightly of cigarette smoke. Aleene's Big Book of Crafts Christmas Fun Card 34: Angel Quilt, Oxmoor House/ Leisure Arts, 1995. Pattern sheet from subscription series; fabric pieces and fusable webbing, with powder puff faces. Excellent condition. May smell slightly of cigarette smoke. 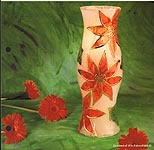 Aleene's Big Book of Crafts Christmas Fun Card 35: Christmas Hurricane Lamp, Oxmoor House/ Leisure Arts, 1995. Pattern sheet from subscription series; faux stained glass technique with tissue paper and glue. (See Tips & Techniques Card 35 for more info on Faux Stained Glass, but all instructions seem to be here for this project.) Excellent condition. May smell slightly of cigarette smoke. 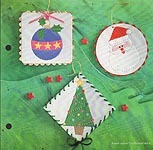 Aleene's Big Book of Crafts Christmas Fun Card 36: Candy Ornaments, Oxmoor House/ Leisure Arts, 1995. Pattern sheet from subscription series; colored pencil on Shrink- It. Excellent condition. May smell slightly of cigarette smoke. Aleene's Big Book of Crafts Jewelry Box Card 31: Jingle Jewelry, Oxmoor House/ Leisure Arts, 1995. 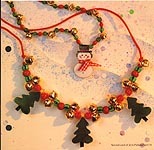 Pattern sheet from subscription series; Shrink- It Christmas Tree and Snowman charms strung with beads and bells. Excellent condition. May smell slightly of cigarette smoke. 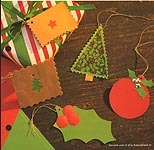 Aleene's Big Book of Crafts Easy Group Projects Card 33: Quick Holiday Tags, Oxmoor House/ Leisure Arts, 1995. Pattern sheet from subscription series; crafted from lefover scraps of paper. Excellent condition. May smell slightly of cigarette smoke. Aleene's Big Book of Crafts Easy Group Projects Card 35: Window Screen Ornemants, Oxmoor House/ Leisure Arts, 1995. 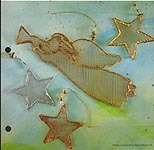 Pattern sheet from subscription series; angel and star snipped from window screen and embellished with metallic paint.. Excellent condition. May smell slightly of cigarette smoke. 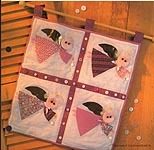 Aleene's Big Book of Crafts No Sew Magic Card 36: Angels & Hearts Garland, Oxmoor House/ Leisure Arts, 1995. Pattern sheet from subscription series; fabric and fusable web. Excellent condition. May smell slightly of cigarette smoke.